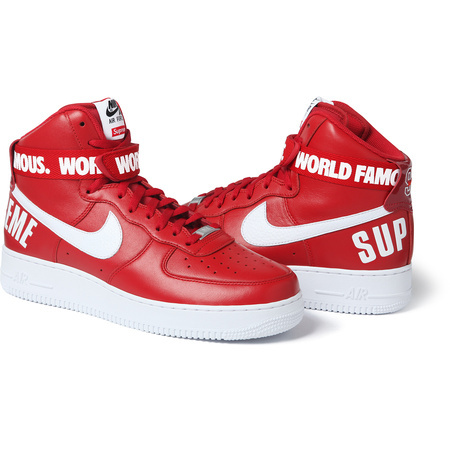 Nike/Supreme Air Force 1 … Is the Hype Worth It? For $150 and lots of patience and luck, hype beasts everywhere are urgently lurking across the Internet for the newly released and highly anticipated Nike/Supreme collaboration Air Force 1s. With all things considered, are the sneakers worth it once they’ve made it to dead stock-only status (in which cases, prices will have dramatically increased)? Nike offers a customization service for all sneakers carried by the company. A point that is often being made is that it is very easy to have your own pair of Air Force 1s, sans the Supreme branding, for a reasonable price, looking exactly the same as the collaboration pair. So what is everyone really paying for? Is it worth this type of hype? I had my eyes on the sneakers for quiet some time. They come in three different color ways (black, red, or white). I found the white ones to be pretty great until I realized why I wanted these and not even the pure Nike 1s. It was the word “Supreme” stamped across the back of the shoe and the motto “world famous” spread across the front strap, complementing the bold, black Nike check mark on the side. I felt my brain whirl and my heart sadden when I realized what I was becoming. Palms on my face, resembling Van Gogh’s,”The Scream, I felt the onslaught of hype beast symptoms — a craving for popular material items, such as exclusive street wear, and new-wave, snob-like tendencies. A hype beast is all about the newest and the latest in modern culture, whatever is considered “cool” before it’s common. This sneaker collaboration is more than just an exciting release; it is the defining moment in one’s hype status. The road will either be long and possibly painful or simply a no-strings-attached hefty investment. It’s your choice to make. Is it worth it? Galila Daniel is a reporter for 101Magazine.net.